To support communities and businesses affected during the floods of December 2015 the UK’s biggest Mountain Festival will be reaching out beyond its award-winning November event to create two free pop-up events this summer, set in the beautiful surroundings of the Lake District. 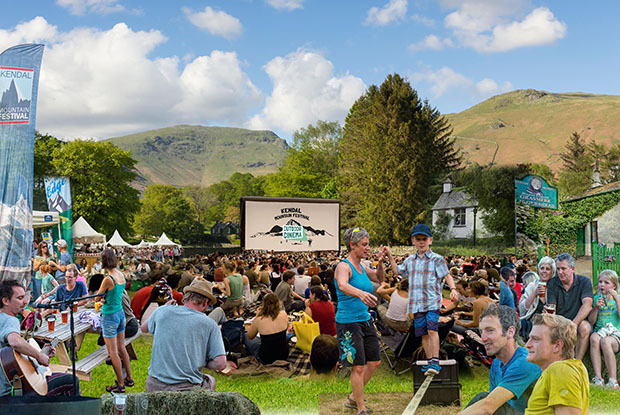 Framed by Cumbria’s most dramatic natural scenery as a backdrop, the ‘big screen’ will visit open-air locations in Grasmere and Ullswater where audiences can expect to be wowed by the best action adventure films from around the world framed by Cumbria’s most dramatic natural scenery as a backdrop. Each evening will also feature top speakers, live music, food and drink providing plenty of fun for all the family. Locations: Grasmere, in the heart of the Lake District, is a picturesque village surrounded by spectacular fells and peaks. The natural beauty of the area has provided inspiration for painters, poets, writers and craftsmen and over two evenings. The shores of Ullswater then provide the framework for the second largest lake in the English Lake District and for many the most beautiful in the UK, running for approximately 9 miles in length. Both very fitting settings for the Kendal Mountain Festival to bring their award-winning combination of stunning films and unrivalled entertainment.